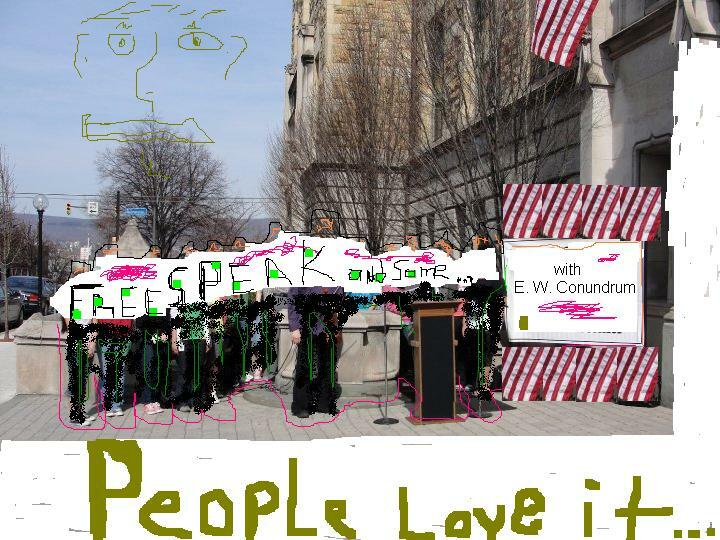 Free Speak and Some with E. W. Conundrum is a weekly free form radio program combining music, literature, interviews and frank talk about current events, hosted by polymath E. W, Conundrum. Stories, Essays, News, Poetry, People, Interviews, Music, and regular Monthly Segments delving into various aspects of the Human Experience… Some of these segments are: Almighty Todd, Raul the Social Hipster, Cab Fair, Serf William, Kitty Belle Do Tell and Dr. De Niente to name but a few. Listen to each weekly episode debuting on Sundays at 11:00am – 12:30pm and re-broadcasted Thursdays 7:30pm – 9:00pm here on 105.7 and 90.3 WFTE. This entry was posted in Free Speak and Some with E. W. Conundrum by Jake. Bookmark the permalink.